AFC West foes will add the next chapter to their storied rivalry when Philip Rivers and the San Diego Chargers clash with Peyton Manning and the Denver Broncos on “Thursday Night Football.” The division tilt is just one of a number of intriguing games on the NFL Confidence Pool Week 8 sheet. 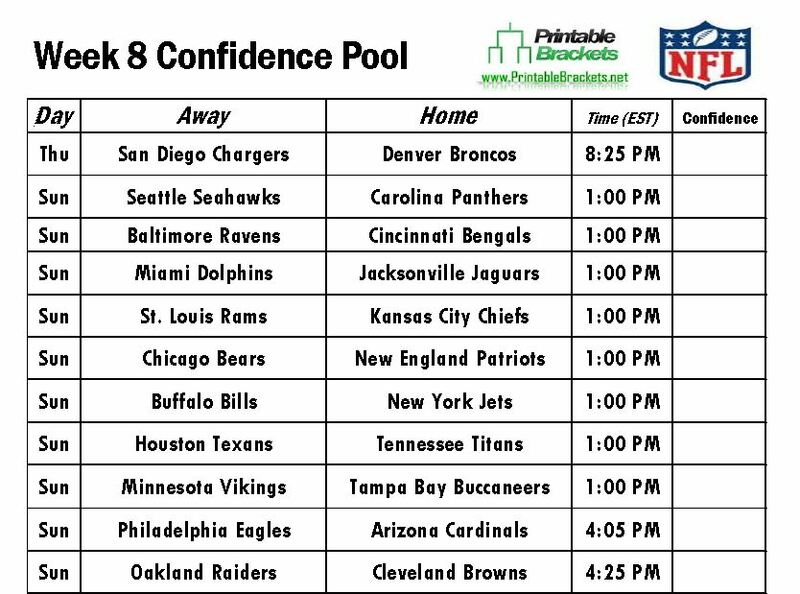 It’s not too late to start an office pool with the downloadable and printable NFL Confidence Pool Week 8 sheet. You can also get things going with a more traditional Week 8 Pick Em pool sheet. Both pool sheets are free from PrintableBrackets.net. The Chargers and Broncos hooked up three times during the 2013 regular season. After splitting the regular season series with each team winning at home, the Broncos won the game that counted most. Manning and the Broncos held on for a 24-17 home win in the divisional round of last year’s playoffs. Meanwhile, an AFC North match-up between the Baltimore Ravens and Cincinnati Bengals headlines the early Sunday games on the NFL Confidence Pool Week 8 sheet. The Detroit Lions will be in Atlanta to face the Falcons, the Chicago Bears will clash with the New England Patriots, while the Kansas City Chiefs will host the St. Louis Rams. In late afternoon action on the NFL Confidence Pool Week 8 sheet, the Indianapolis Colts with collide with the Pittsburgh Steelers, while the Arizona Cardinals will play host to the Philadelphia Eagles. A total of two teams will have their bye in Week 8. The New York Giants and the San Francisco 49ers have the week off.